Europe has just made a new record. More than 50% of PET bottles (1.6 million tonnes) were collected for recycling in 2011, said Petcore, a Brussels-based European Pet bottle recycling association. The record was made possible through the cooperation of compliance agencies, national bodies and European recyclers. But recyclers in Europe still have capacity to handle more material with capacity utilisation in recycling plants only 77% at present. Recycling rates vary widely in Europe, with collection rates of over 70% in about a third of the countries surveyed. 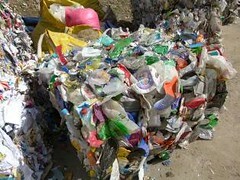 More than 50% of the PET recycled in Europe is used to make containers or sheet for new packaging. The next-highest end market, fibre, accounts for 39% of the total.